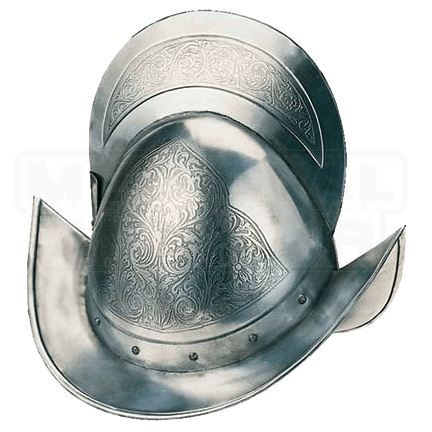 The Spanish Round Morion Helmet by Marto is a full size reproduction of a 16th century helmet. The helmet provided protection for the head and featured a rounded profile, semispherical crest, and a crescent shaped brim. The Morion helmet was used in Europe by infantrymen between the second decade of the 16th century and the first decade of the 17th century, in particular by Spanish soldiers but also used in other armies of Europe. Made entirely of polished steel and enriched with decorative engravings of floral motifs on both the crest and the skullcap, this helm is a beautiful piece of decor that would serve well as a functional yet visually appealing display piece.